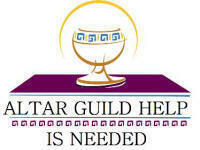 ALTAR GUILD is in need of volunteers for both the early and late services. This is a great way to serve our Lord for individuals, couples, parents and confirmed children, for a few hours one month of the year. If you would like more information please contact Susie Berry 727 638 0577, email marysusan@tampabay.rr.com.